A guide in "Can you not?" Now, we’re not saying that Camacho is a condescending person. It’s entirely possible that this was just a one-off incident that doesn’t reflect her character. What we are saying, though, is that what she said and how she said it did come across as condescending. And even if she had good intentions, that doesn’t stop Bersola-Babao from feeling insulted. Besides, there are times when telling people not to touch art is called for. This wasn’t one of them. 1. Ask yourself: do I own this gallery? If you see someone who you think is breaking the rules or art etiquette, don’t snap at them. First, check if they really are doing something wrong, and then report them. After all, if you’re coming in as a guest, it’s really not your job to police anyone else. Even if you do, in fact, own that certain space, that still doesn’t give you a free pass to be a jerk. You may own that space, but you don’t own the concept of art. Art is for everyone. No one likes invalidating snobs! Every work of art is open to interpretation, even if that interpretation goes against the creator’s intentions. (As Roland Barthes said, “The author is dead, yo”) The only time it’s okay to do this is if they’re deliberately trying to misconstrue the piece to support their own sexist, racist, or otherwise discriminatory beliefs. Now that’s just wrong. This is something I experienced while walking around Art Fair. There was a representative in one gallery that, when I inquired about the price of one painting, replied to me in a brusque, dismissive tone, as if she knew that I had no money to buy it. She was right, but I was there to write an article about Art Fair and it was the media preview, so I had all the right to ask. The problem here isn’t my hurt feelings (I got over it in, like, a minute), but that she looked at a person and sized them up in a matter of seconds. That’s incredibly discriminatory, which is bad for an event that touts itself as being inclusive. Tone is everything. For example, “thank you” is generally a nice thing to say to someone, but with the right tone, it could be the most devastating. It’s how I knew the lady at the gallery was being dismissive. The thing is, if you’re not careful, your tone can be unintentionally insulting. 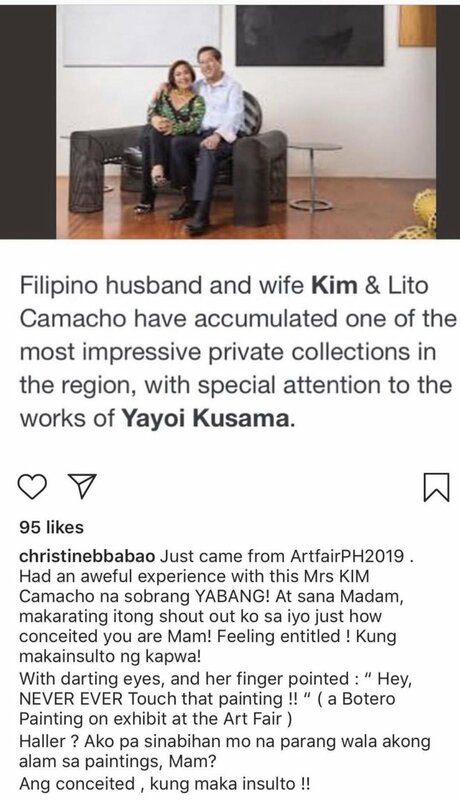 It’s probably what happened in the Bersola-Babao incident: Camacho didn’t realize her tone that her tone was condescending and offensive. Now, we don’t like art snobs, but that doesn’t mean we think it’s okay to disregard Art Fair etiquette. Read our guide on that here.